View the website. Then Contact Us for more information. Use code 25thHourBiz. SourceLink adds document management features to QuickBooks on your desktop. With SourceLink, QuickBooks and a good scanner, you can go paperless. SourceLink gives you the ability to easily file, retrieve and organize your source documents associated with each QuickBooks record. 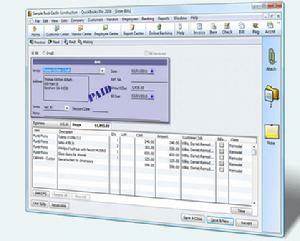 SourceLink is a software package that can be purchased for single or multiple users. SmartVault stores your PDFs in the cloud; SourceLink stores them on your PC. SmartVault is a subscription service; SourceLink is a one-time purchase. With either product you can attach linked documents in QuickBooks with a click of the mouse � the process of linking documents is as simple as adding an attachment to an e-mail. Link files already stored on your computer, or scan additional documents directly into SourceLink. Then shred or recyle that paper! Visit SourceLink to learn more, then contact us to purchase and get started. We'll help you go paperless!